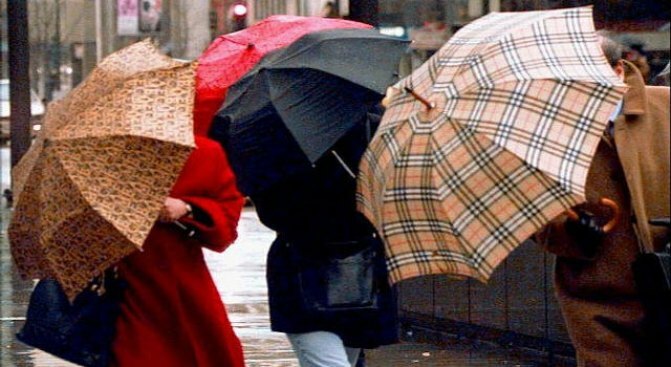 Don't put your umbrella away just yet ... more rain expected Thursday night, Friday and possibly Saturday. Finally, it rained and rained and rained over parts of North Texas on Wednesday and it isn't stopping anytime soon. "After a deluge of rain on Wednesday, much of North Texas will get a short break for Thursday," said Jennifer Lopez, NBC 5 Meteorologist. "More waves of rain move through late Thursday night and throughout Friday. Clouds stick around and temperatures won't heat up until late Sunday." Lopez expects a high of 41 Thursday, 39 on Friday and 53 on Saturday. By Sunday, things should warm to the mid 60s. Parts of the state experienced record rainfall totals for the date and more rain was expected Thursday with a slight chance of freezing rain in West Texas and snow or sleet in the Panhandle, according to the National Weather Service. The 2.88 inches that fell at Dallas-Fort Worth International Airport broke the record of 2.01 inches set in 1990, said National Weather Service meteorologist Eric Martello. A 60 percent chance of rain was expected around Dallas on Thursday and a 40 percent chance was forecast for the Fort Worth area. Isolated flash flooding is possible if the ground becomes become saturated, Martello said. "But I think most people, especially cattle ranchers and farmers, will see the benefits of this," Martello said. "The rain came at a good time. Let's put it that way." At 4.42 inches of rain this year, the Dallas-Fort Worth area is about an inch off its normal year-to-date rainfall total of 5.37 inches, he said. That won't end current drought conditions, he said, "but it helps." Moisture from the Gulf of Mexico and an upper level storm system in the southwestern portion of the United States could create the right conditions for snow to fall in the Panhandle, meteorologist Ken Schneider said. It's not unusual to see snow this time of year in the Panhandle, he said. Average snowfall for March is 1.7 inches and 1 to 3 inches of snow was possible on Friday and Saturday, he said. "With temperatures above freezing we could see rain during the day and snow at night," Schneider said. "Kind of back and forth." Inclement weather struck in Central Texas on Wednesday and forced a baseball game in Austin to be postponed and another in College Station to be rescheduled. An 80 percent chance of rain was forecast around Austin on Thursday and a 70 percent chance was predicted for the San Antonio area. Showers and thunderstorms were also expected along the Gulf Coast with a 50 percent chance predicted for the Houston area and a 40 percent chance forecast around Galveston. Gusty winds could reach 23 mph. West Texas was one of the few areas expected to receive sunshine. Partly sunny skies were forecast for the El Paso area but freezing rain before 1 p.m. was possible around Midland and Odessa. Highs near 40 and overnight lows around 30 were expected there.